Garson, G. D. (2016). 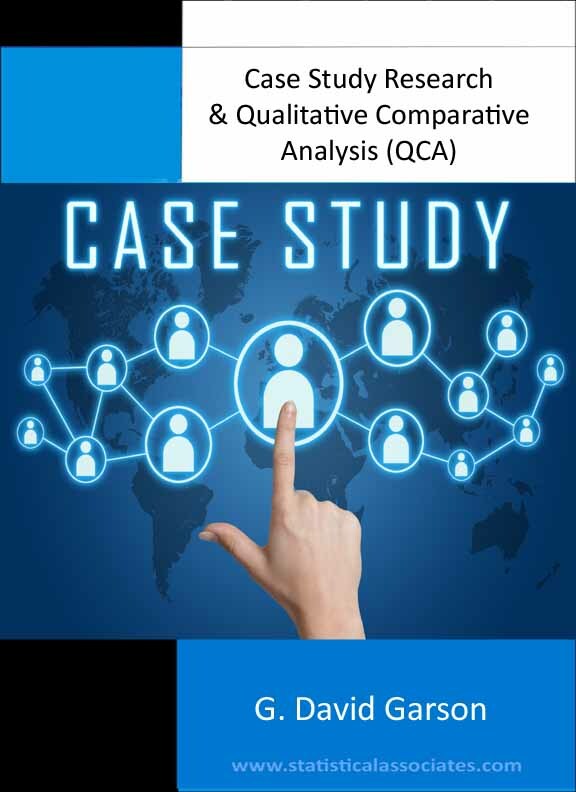 Case Study Analysis & QCA. Asheboro, NC: Statistical Associates Publishers. ASIN number (e-book counterpart to ISBN): ASIN: B007UWXBH0. An illustrated graduate-level introduction to case study research, including qualitative comparative analysis (QCA), also known as configurational analysis, and covering information metrics methodology. Covers the revolution in case study research associated with qualitative comparative analysis using Boolean pattern matching and also the information metrics approach creating measures of information gain / uncertainty reduction for causal variables and patterns in case research. Rewritten, updated, and expanded throughout. Covers fsQCA software with worked examples. Covers information metrics / structured-focused comparison methods. 1. It is useful for causal explanation, leading to theory development. uncovering both necessary and sufficient conditions needed for a desired outcome. causes -  a  "causal  package" -  rather  than  a  single  cause). causal pattern while absence of the variable is important in a second causal pattern. researcher-specified causal assumptions (intermediate solution). recursive as is required for most models using standard quantitative modeling techniques. different cases as appropriate based on external knowledge). approach which shows how combinations of causal variables work in sets. 11. Generalization is possible whether the number of cases is small, medium, or large. approaches, which are often thought to be more valid than monomethod research designs. to include in a quantitative model or by spotlighting mediating variables.